At Ultimate Pet Nutrition, we believe optimal nutrition is the key to a happy life — and that’s why we strive to give your pet the most advanced, all-natural products on the market. Dr. Gary Richter developed Nutra Thrive with one goal in mind — to give your pet everything it needs to live a long, healthy life. That’s why every ingredient is hand-selected for maximum quality — and it’s why we never use any fillers, artificial ingredients, or preservatives. forefront of pet nutrition — offering a healthy, holistic approach to common health concerns. The mission of Ultimate Pet Nutrition is to help our beloved companions live the happiest lives possible. We want pets to have the nutrition they need to be at their healthiest. That’s why we only offer advanced, all-natural products. We carefully choose every ingredient to make sure it is of the highest quality, and free of any preservatives, artificial ingredients or fillers. And we back our products with a 90-Day Refund Promise. That means if you don’t see noticeable improvements in your pet’s life, simply send back any used and unused product within 90 days of your purchase, and you’ll receive a full, hassle-free refund. Obesity in pets can develop from overeating or from lack of exercise.The health risks of obesity are alarming, and they only get worse the more obese a pet becomes. But sometimes, it’s hard to tell whether a pet is obese through observation alone. Your dog, for example, may be perfectly fit, yet still be malnourished. On the other hand, a dog may “look” healthy, but they could actually be overweight. With optimal nutrition and regular exercise, you can significantly reduce your pet’s chance of becoming obese. The pet food industry is massive – generating billions of dollars a year. While regulations are in place, they’re mainly there to make sure that foods are safe, and that they provide a minimum amount of nutrition. But minimal nutrition isn’t enough – you want your pet to have optimal nutrition. This means providing food that will not only help prevent future health problems, but also help improve health issues that might be affecting your pet right now. All-natural foods can provide that kind of optimal nutrition. You obviously want your pet to have the best, healthiest life you can provide. But while you are careful about the food you give your companion, they still may not be getting the nutrition they really need. That’s why you should have a talk with your vet regarding the nutritional plan that will be exactly right for your pet. Your vet will work with you to find the best diet to meet your pet’s nutritional needs. Supplements go above the basic dietary needs of pets, and they’re an effective approach to supporting your pet’s well-being. 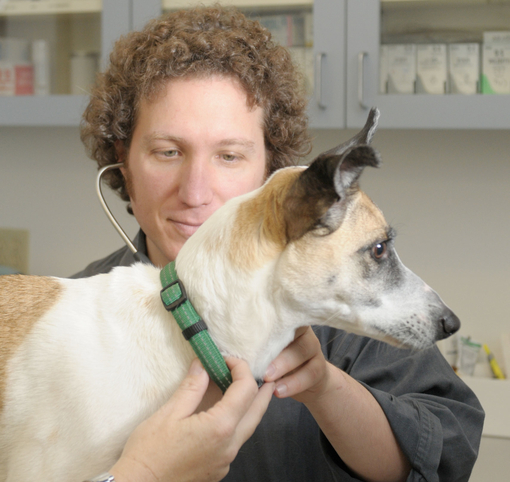 Always speak to your veterinarian before starting your pet on any type of supplement regimen. Probiotics are beneficial bacteria that help reinforce the bacteria already in a pet’s – as well as a human’s – digestive system. They help ensure proper digestion and support the immune system. When there are more “bad” bacteria than “good” ones, that can lead to gastrointestinal problems, and other issues. Probiotics help maintain a good balance between harmful and beneficial bacteria, so that your pet’s gastrointestinal tract will continue to work as it should. 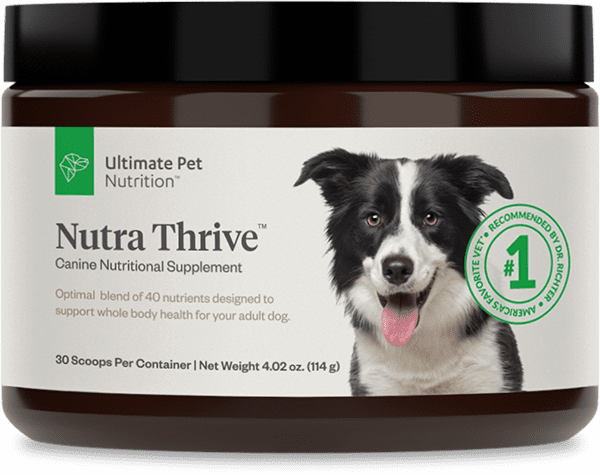 Nutra Thrive from Ultimate Pet Nutrition is a supplement powder that is packed with antioxidants, digestive enzymes, vitamins, and probiotics. This easily-absorbed product helps support higher energy levels and healthy digestion by maintaining a balance between the “good” and “bad” bacteria in your pet’s gastrointestinal system. Nutra Thrive not only helps improve your pet’s digestive health, it also contains nutrients to boost their immune system. And the best part — it comes in a bacon flavor that your dog will love. You’ll need to closely observe your pet, and make a decision about how much to feed them based on what their body tells you. For example, if you run your hand over your dog’s back and you notice bumps or ridges along the spine, you may want to dish out a little more food at each meal. If you’re not sure, you can always talk to your vet about this, and they can tell you exactly how much food you should be giving your pet. Some vitamins consumed by humans could also be beneficial for dogs. For example, B-complex vitamins have been shown to help support your dog’s digestion and heart health. These vitamins may also help keep your dog’s skin healthy. Always talk to your veterinarian before giving your dog any sort of vitamin supplement. They’ll be familiar with your dog’s exact health situation, and they’ll be able to tell you if supplementation is the right choice for your pet.